We decided to dine at Warung Kultur Seminyak due to the rave reviews on Trip Advisor. It is a little tricky to find and because our incompetent taxi driver got lost and dropped us off in completely the wrong spot we had a lengthy trudge to the restaurant. I almost gave up but I am so glad we persisted. Warung Kultur prides itself on using the freshest local ingredients to make traditional dishes that have delighted diners since 2013. What Warung Kultur Seminyak lacks in size it make up for in ambience amid walls dotted with authentic Indonesian antiques. The menu is tight but most will find something pleasing as there are a handful of western dishes for the less adventurous. Beer was the only alcohol on the menu so while The Hubs’ was sorted I was left craving an icy glass of white all night. The Hubs and I usually share an entrée as we are not massive eaters. 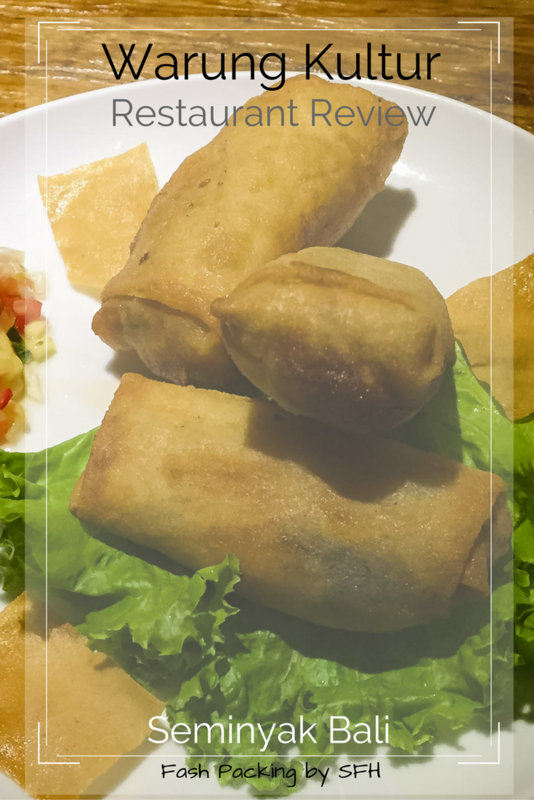 When we visited Warung Kultur Seminyak however the hubs had his heart set on the signature spring rolls while I couldn’t go past the corn fritters. The chicken, prawn and vegetable spring rolls delighted The Hubs yet I wouldn’t touch them because I cannot stand prawns. They came with two types of Chili sauce and were generous in size. The little salsa was a surprise hit of the dish and was simple and delicious. He must have enjoyed them because he proclaimed them the best spring rolls he has ever eaten which is a massive claim. The Hubs’ food came quickly but my entrée did not arrive until mid-way through my main course which I thought was strange. When my entrée did arrive I had already started my main so I wasn’t able to eat a lot. 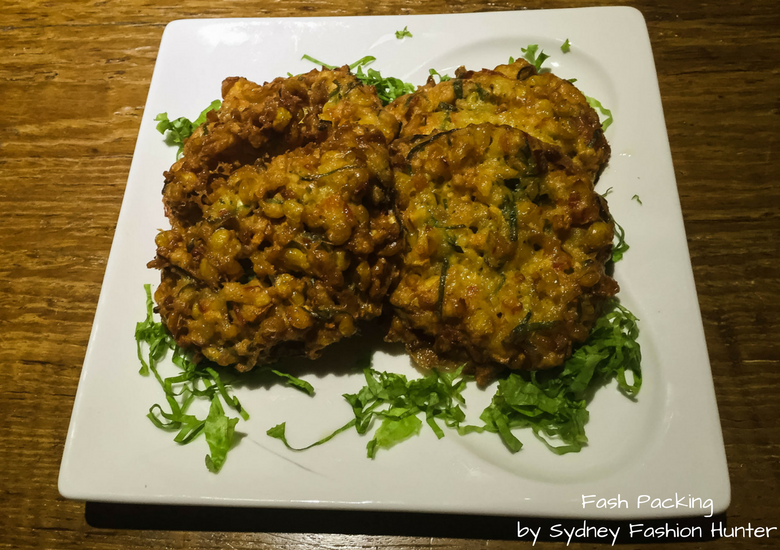 While pleasant and full of flavour the fritters were a just a little too oily for my liking. I settled on the Beef Rendang rather than the Kare Ayam as it is one of my very favourite curries. The ridiculously tender beef came smothered in a rich, hearty gravy which was so moorish. My one complaint was that I would have like more sauce. Fluffy white rice on the side was perfect for soaking up the rich sauce. The Hubs’ generously sized Bumbu Rujak Chicken was perfectly cooked and swimming in a delicate sweet chili red curry sauce. I couldn’t resist a mouthful and it was divine. We thoroughly enjoyed our evening at Warung Kultur Seminyak. The food was delicious, the service was efficient and the prices were tiny. Don’t just take my word for it, read 250 other reviews on Trip Advisor. 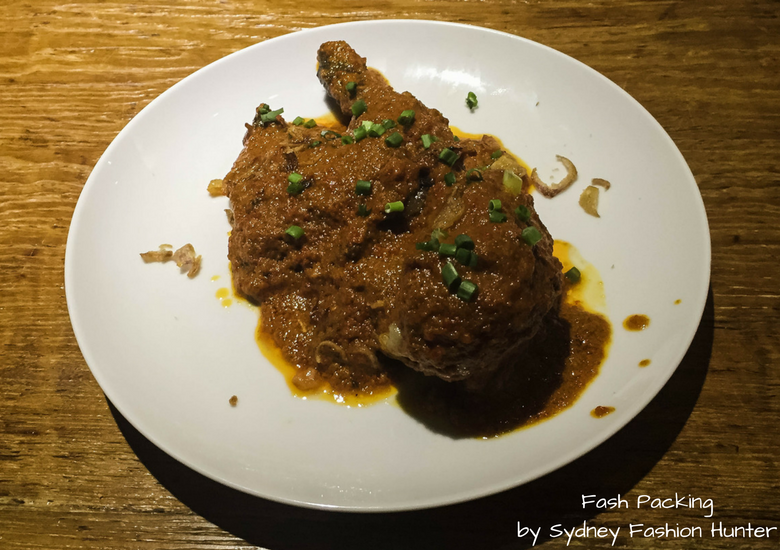 Make sure you check out more of my Bali Restaurant reviews here before you dine out again. Average Cost: I paid approx AUD $25 for two courses for two people with drinks. If you liked this you should check out my other Bali restaurant reviews and my epic list of 110+ things to do in Bali. So will you try Warung Kultur Seminyak when you are next in Bali? My Bali basics post is a must read for Bali first timers. Disclaimer: I paid for my meal at Kultur Warung Seminyak in full and as always, all opinions are my own. This post contains affiliate links which may earn me a small commission. Thank you for discovering another amazing place in Bali. I am planning to visit the island in winter so I am bookmarking this restaurant to visit. 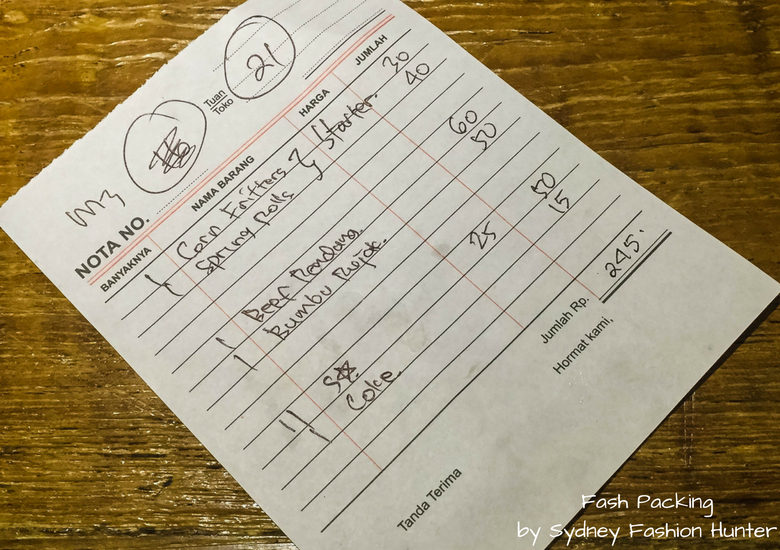 I visited Bali 6 years ago so I can’t remember if 25AUD is a reasonable price for a dinner for two? It’s impossible to eat for anything close to that in Australia. It’s about USD$20 so I think it is incredible value! Haven’t really had Warung ever before. But I must say, if there are 250+ reviews who say that this is good food, then I’ll give it a go. I just don’t know what to expect if they are spicy or what. Sure hope that these foods are also available here in the Philippines. I do love spicy but most restaurants in Bali will warn you if something is hot and let you pick the heat level so you should be OK ? Agree Maja! The only thing I can think of is they must have thought I wanted it as a side. Lost in translation is always fun when travelling ? The atmosphere and the design of the restaurant is very pretty, I like the details on the walls and the low lighting. it makes it look very romantic. The food seems delicious and great value for money. I love beef so I would definitely go for that curry. It was quite rustic but that is usually the best way to get an authentic meal. I’ve been dying to go to Bali! I think the best way to start that trip is to try Balinese food. I’ve been to Indonesia but only Jakarta. Everyone says that Bali is a country of its own. I haven’t been to Jakarta but I heard the same. Food is one of life’s greatest pleasure ? Bali sounds like a nice and interesting place to visit not only because of the tourist spots but also because of the food. Glad that the reviews didn’t disappoint the actual experience! I love being able to read positive reviews and actually having a good experience when dining in a certain place. Good thing that the food was really affordable, too! I agree. I have always found Trip Advisor pretty helpful when searching for a good restaurant. I’m hoping the hubs and I can go to Bali this Autumn, were adventurous eaters so this restaurant sounds up our alley. Did the fritters have filling?? They look interesting, I can’t recall having fritters before but the prawn spring rolls sound Delish! I’ll be back there in March and my youngest son (21) and his GF will be tagging along. I can’t get enough lol! No they didn’t have filling, the firn mix was just shaped and fried. The food looks fantastic – glad you enjoyed your meal, and by the looks of things you got a pretty good bargain as well. I can’t wait to taste some authentic food from Bali and will come back to your site for more recommendations. There are so many places to eat it can be quite daunting choosing. I always do my research carefully before I eat. Life is to short for bad food! I also love my beef to be all tender and rich in gravy sauce. i havent been to Indonesia. But we have plans to tour this last quarter with a friend. certainly your recommendations will always be noted. That’s awesome Berlin! I hope you have a fantastic trip! Bali is one of the places that I am planning to visit next year. I just need to convince my boyfriend that he would like it there. He’s worried about the food – he’s a picky eater whilst I am an adventurist when it comes to dishes. I definitely took down notes and I will check out Warung when I get to Bali. I’d enjoy that authentic Rendang and the prawn spring rolls! The Hubs was extremely reluctant as well when I first suggested Bali. Now he loves it as much as I do. There are so many great places to eat than even fussy eaters will be taken care of. I’ll be posting a few more restaurant reviews over the coming weeks so I’m sure he will find something he likes ? The food looks delicious. I have been wanting to visit Indonesia for a while now. Hearing so much about food just makes me want to be there. Bali is great. I can’t get enough to and we go every year. I have to admit the fabulous food is definitely one of the big draw cards. That curry really does look amazing! Curry has always been a big favourite of mine too!! Such a shame your entree was so late to arrive – but still sounds like an awesome meal! It was most definitely a little strange! Quite possibly there was something lost in translation and they thought I wanted it as a side but it really was a great meal. Looking forward to going back when we next visit. The more I am seeing posts on Indonesia, the more I am appreciating Indonesian food. I used to think it’s all noodles but have since learned that there is a diverse food dishes. From the food you tasted, one particular dish I would love to try is the beef. The photo doesn’t do the food justice, it appears ordinary, but you said it is ridiculously tender? Just the way I like my beef! I think it’s hard to make Rendang look pretty Robert lol. If it comes down to looks or flavour I’ll take flavour any day. There is soooo much more than just noodles on offer and Bali is a great place for foodies ? Jotting this as a must try when in Bali. Thanks for sharing! Definitely one for you list Gene ? And to add, the reason why I’d have this on my list is that sometimes you can’t really rely on search / review engine sites when it comes restaurants in Asian Cities. Posts like this from blogs would really be helpful. Agree. As well as blogs I always read the Trip Advisor reviews ? Hahaha. If only they didn’t have prawns ? Warungs in Bali are amazing. I’m not that big of a beef eater, but I would definitely do chicken. I would definitely make an exception to try the beef curry. 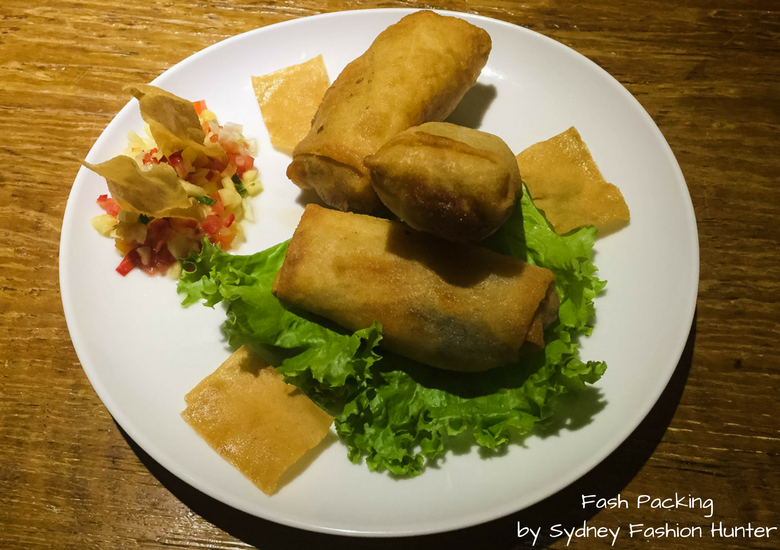 I was recently in Bali and the spring rolls are the best! I’ll definitely have to check this place out when I go back! Wow that beef rendang looks soooooo delicious! 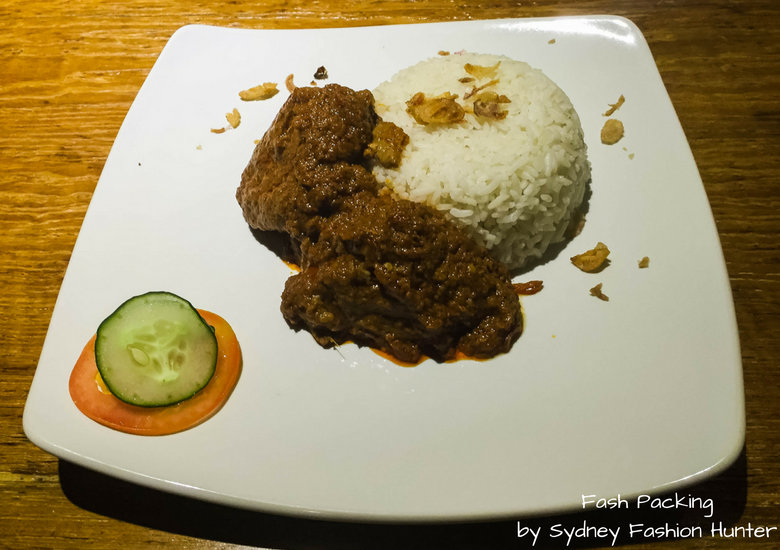 It’s hard to find a good beef rendang… I have found many to be too dry. 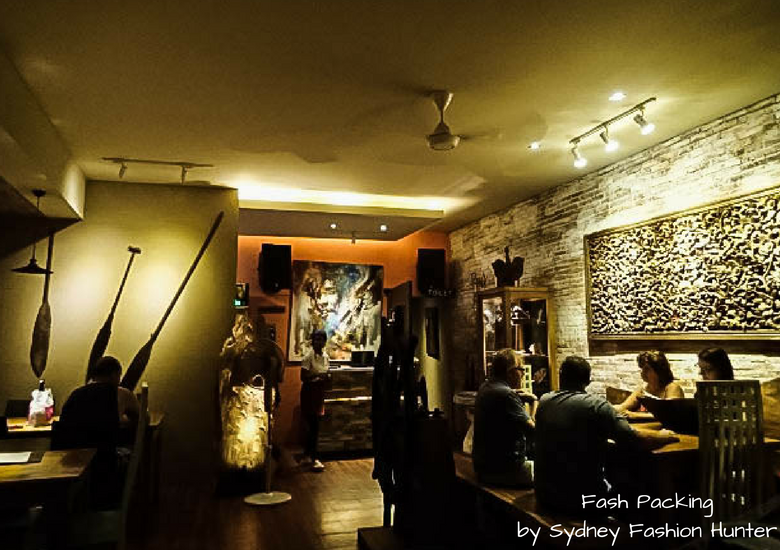 Your review is great – the restaurant sounds like a must visit on my next trip to Bali. Thanks for sharing. Fabulous AND great value is a winner in my book Soraya ?